Enjoy the uniquely renovated bathroom in Suite #301 and enjoy the resort's pool, hot tub, sauna, and game room. Chateau LeVeaux Suite 301 is also known as the Wolf Room. This room has a queen bed. The suite has a tv with satellite and a DVD player, mini fridge, small microwave, and a coffee maker. There is a decorative fireplace and eating area overlooking Lake Superior. Enjoy sweeping, unobstructed Lake Superior views out of the windows. You will love the unique tree trunk vanity in the bathroom. The shower/tub combo in the bathroom area features a stationary and handheld shower head. Chateau LeVeaux is a 34-unit vacation rental resort located on Lake Superior`s North Shore. The large lobby is a great meeting area for large groups renting multiple units. Enjoy your breakfast in the community lobby area. Complimentary coffee is available for you to enjoy in the mornings. The community deck has plenty of room for large groups to gather. 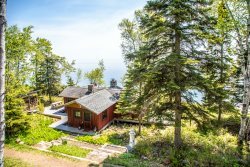 Or just you and your loved one sipping coffee and enjoy the Lake Superior views. Enjoy an outdoor meal on the community deck. Take a dip in the heater indoor pool. The pool area also has a hot tub, sauna, and a game room, great for kids. On the grounds of the resort there are lots of places to grab a seat and enjoy the view. Or head down the stairs to the private lake front area. The lake front area in from of Chateau LeVeaux is ledge rock, great for sitting and watching the waves roll in. The gorgeous views looking up the shoreline. And don`t forget the views looking down the shoreline. The community fire pits are also a great place to gather and enjoy time with friends, family, and other Chateau guests. Map of Chateau LeVeaux property. This unit is located on the third floor of Chateau LeVeaux Resort where you can see far out onto the lake and watch the seagulls, waves, and moon rise from this beautiful and updated suite. Our most affordable choice, the Wolf Suite is perfect for a honeymoon or romantic getaway!